The Michael Buble biography is the story of a star who almost never made it. Buble has sold 20 million albums worldwide to date, but his music career almost never happened at all. Unlike the meteoric rise to fame experienced by his fellow Canadian Justin Bieber, Buble's road to stardom was a long, hard slog. Born Michael Steven Buble on September 9, 1975, in Burnaby, British Columbia, Buble's family were first to notice his musical chops when they heard him singing White Christmas at a family party. His grandfather was his first big fan. A plumber by trade, Buble's grandfather would help secure gigs for his grandson by offering plumbing services for free in exchange for letting Buble take the stage and perform. His grandfather also used plumbing jobs to pay for singing lessons for Buble. At the age of 18, Buble entered a Vancouver talent show and won - but then found out he was disqualified because he was not old enough to compete. The show organizer helped Buble enter the Canadian Youth Talent Search. After winning that competition, Buble hit the touring circuit, performing at just about any show he could get. During this time, Buble performed at private parties, corporate events, club shows, cruise ships, malls, talent shows, festivals, hotel lounges and more. Any place he could convince someone to let him perform, he grabbed the opportunity. It was through one of these less traditional gigs that Buble finally got his big break. By the year 2000, Buble was prepared to pack it in and give up music. He had moved to Toronto for his music career but began making plans to return to Vancouver and try his hand at journalism. A strange series of events helped change all of that. It all began when an aide to Brian Mulroney, former Canadian Prime Minister, saw Buble perform at a corporate event. This aide, named Michael McSweeny, bought a copy of the independent album Buble sold at shows. McSweeny let Mulroney and his family listen to Buble's album. The Mulroneys then hired Buble to perform at their daughter's wedding. Successful music producer and executive David Foster was one of the wedding's attendees and was wowed by Buble's success. Foster was initially reticent about signing Buble to his own label, simply because Buble's traditional big band/jazz/swing sound was a new world to him. Buble relocated to Los Angeles, where Foster lived, hired an agent, and continued working on Foster to take a chance on him. Foster eventually told Buble that he would produce an album for him if Buble could come up with $500,000 to cover costs. After Buble came up with the cash, Foster began recording him - eventually agreeing to cover the production costs himself in full. Foster signed Buble to his own label, 143 Records (a division of Reprise, which itself is a division of Warner). The stamp of approval from Foster helped Buble finally land a management deal with Bruce Allen, who Buble had been trying to convince to manage him for many years. Buble's self titled debut album was released in February 2003. It charted in Canada, the United Kingdom, Australia and South Africa. It failed to make much of a splash in the U.S., though three of the singles went Top 30 on the adult contemporary chart. He released a Christmas album that year that was only marginally successful in all of these territories. Over the lifespan of the album, Buble's popularity began to grow through a heavy touring and promotional schedule. Without releasing any new music, Buble won New Artist of the Year at the 2004 Juno Awards. It's Time, Buble's second album, was released in February 2005. This album was significantly more successful. It reached number one in Canada, Italy and Japan, number two in Australia and number seven in the U.S. It was also top ten in the UK, Sweden, Austria, Switzerland and Norway. Buble's first album to reach number one in the U.S. was his third release, 2007's Call Me Irresponsible. The album fared equally well in most territories. 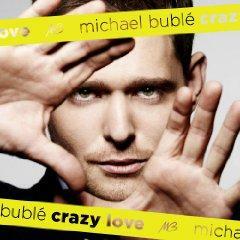 In October, 2009, Buble released Crazy Love. The album did not debut on the top ten in any charts. A touring and promotional campaign is in the works for 2010.